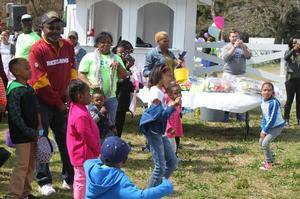 HAMPTON, Va. – Children 10 years old and younger and their parents are invited to come out and celebrate a day of Easter fun. 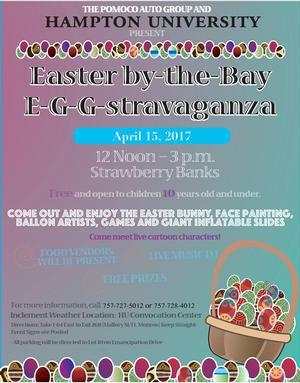 Hampton University and Pomoco Auto Group will host the 12th Annual Easter by-the-Bay E-G-G-stravaganza on Sat., April 15, from noon to 3 p.m., at 30 Strawberry Banks Boulevard in Hampton, Va. This event is free and open to the public. For the last 11 years, the E-G-G-stravaganza has been an action packed event filled with “smile provoking” activities. Children will be able to enjoy face painting, balloon artists, games, giant inflatable slides, SUMO wrestling, and opportunities to race through inflatable obstacle courses. This year, Bubbles-the-Clown is scheduled for multiple performances throughout the fun-filled day. Children will be able to spend quality time with HU’s Mr. Pirate and interact with our new and exciting cartoon characters like Peppa Pig, Poppy, and the Easter Bunny throughout the event. The entire family will enjoy entertainment from a live DJ and members of the Hampton community. The event will also feature food vendors and free goody bags for children. 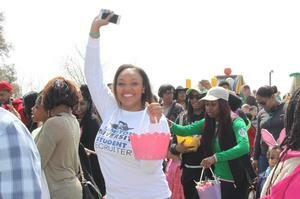 Come celebrate this Easter with HU and the many community sponsors involved in the event. Don't miss your chance to meet some of your favorite cartoon characters and, of course, the Easter Bunny! In case of inclement weather, the event will take place inside the HU Convocation Center. Parking is available in Lot 10, adjacent to the HU Convocation Center. HU shuttles will provide transportation from the parking lot to Strawberry Banks. For more information, please call the Office of Development at (757) 727-5012 and 757-728-4012.